Snake looks like a rattler, sounds like one, has no rattle? If you came across a snake the looked like a rattle snake, sounds like a rattle snake, but had no rattle what would you do? Golden brown coloring with a black lining. The color is the same as some common Arizona rattle snakes. And the rattling noise is an unmistakeable indicator of danger. But this rattling snake has no rattle. While it’s tail vibrates and the sound makes the performance complete, the noise is actually coming from this glossy gopher snake’s mouth. But the rattle snake sound is so convincing, which makes mimicking it the perfect defense mechanism. The gopher snake will even flatten out it’s head a bit to try and pull back into an aggressive stance to really sale the rattle snake act.Well Bill, our Bulwark Birthday Boy (see Bulwark’s Facebook Page), came over to confirm that this rattle-less rattling snake was not an AZ Diamondback and that it was indeed a Gopher snake.Bill is actually more qualified to determine this than we suspected. He apparently use to milk Rattlesnakes for their venom. The venom sells very nicely as it’s part of the costly anti-venom formula. Bill paid for college this way. Does a AZ Gopher Snake Bite? The aggressive rattling sound and strike pose certainly do the trick in warding off enemies. Even after knowing it wasn’t a poisonous snake, I had my reservations about picking it up once it struck it’s pose. But in truth, the gopher snake rarely bites people. They are actually a great ally to Phoenix exterminators because they eat common dessert rodents. And there are a lot of rodents in the dessert. Plenty of mice intrude residential properties each year in Arizona. So after a quick measurement (measuring about 4 feet) and deciding that the snake isn’t dangerous to humans, we will be putting him back out there to fight the good pest control battle. 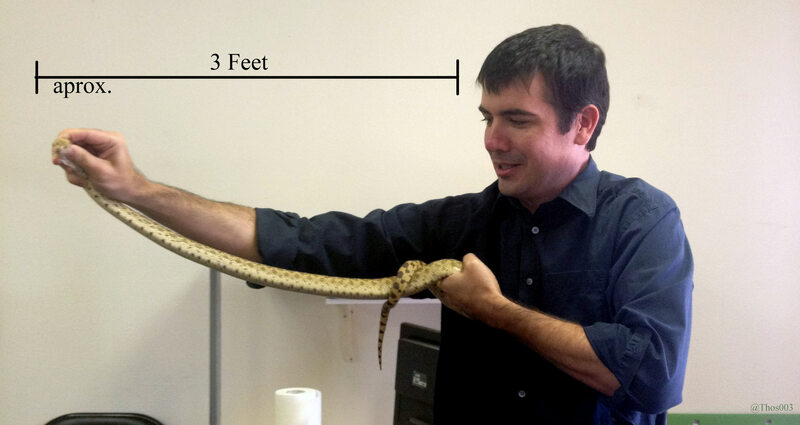 Long live the Gopher Snake. P.S. If it looks like I am straining a little bit, I am, the snake has a lot more muscle than you think …for one so bendy and flexible. hello-I live in the black hills of south Dakota. two days ago a large and aggressive snake came thru my yard. it looked like a diamond back, but had no rattle. any idea what type of snake it was? Rattle snakes can loose their rattles. I would need an image to better help you.